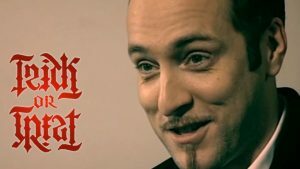 Derren Brown has persuaded members of the public to sign a Faustian pact with him and participate in a macabre game of Trick or Treat. Trick or Treat was a series of six episodes which first broadcast on 13th April 2007. Derren used rotational ambigram cards to select participants – who had previously applied but did not know they had been selected – to give them either a Trick or a Treat. Tricks included waking up in foreign country, a Ventriloquist’s dummy, a street madman and a staged death in an out of body experience, which was later criticised in the UK national press. Treats were teaching a pensioner how to ‘bluff’ in poker, and a piano recital. Trick or Treat is available on Channel 4’s All 4 On Demand service. Alternatively you can watch on Amazon Video.